We are open 365 days a year. Booking is recommended, especially during school holidays and can only be made by phone on 01208 813050. Our most popular Ladies bike. Comfortable seat, upright position, mud guards and panier. This bike is towed behind another adult bike. 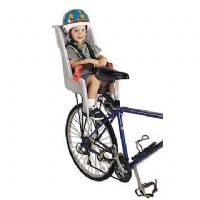 It is stable and allows the rider to peddle when able. 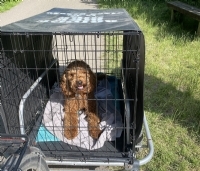 This family spent a long time investigating the options on the Camel Trail before contacting us but were delighted with the bike, as was the young man who rode it. 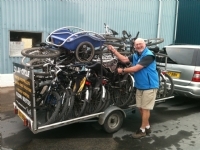 He is able to cycle without worrying about wobbling which enabled them to go all the way to Padstow. 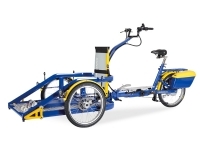 This bike is available with the wheelchair if required but will hold most wheelchairs including those with motors. Highly recommended by users see our image gallery and testimonials for reference. 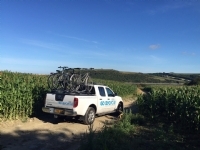 Large range of high quality bikes including Touring, Steel and carbon road bikes and family bikes, all delivered to you. One Way Trips from Wadebridge to Padstow available all year round.